Functional programming offers a lot of abstractions provided either by the core languages or by external libraries suited to solve every day low-level (domain agnostic) problems. A good example is the Option type that models the potential absence of a value. Without Option we would be forced to redundantly reimplement low-level imperative handling of nulls and null reference exceptions everywhere. Apparently it is a good practice to refine our types so that they can be applied to certain categories of problems that have already been solved. Then we can reuse existing abstractions that are battle tested just such as Option. It turns out that the Parser type looks very similar to the state monad which is a monad instance on the function S => (S, A) where S represents the state. In the case of a parser the input state represents the input string and the output state represents the remaining unparsed string whereas A represents the result type of the parser. When we now take into account that parsers might fail we can stack the State on top of an Option with the help of monad transformers. Let’s see if we’ve found an appropriate existing abstraction for parsers (disregarding stack-safety for now) by trying to implement a parser library on top of it. The great thing about this is that we get a lot of functionality for free. E.g. we don’t have to implement combinators for sequencing parsing operations. This is already taken care of by the combined monad instances of State and Option with the flatMap operation. Because we get a Functor instance for free we can map over inner values of parsers. token is implemented with *> and <*. These operators come from the Apply typeclass. They compose two values and discard one of them. In this case the spaces around the token are discarded while the token is kept. 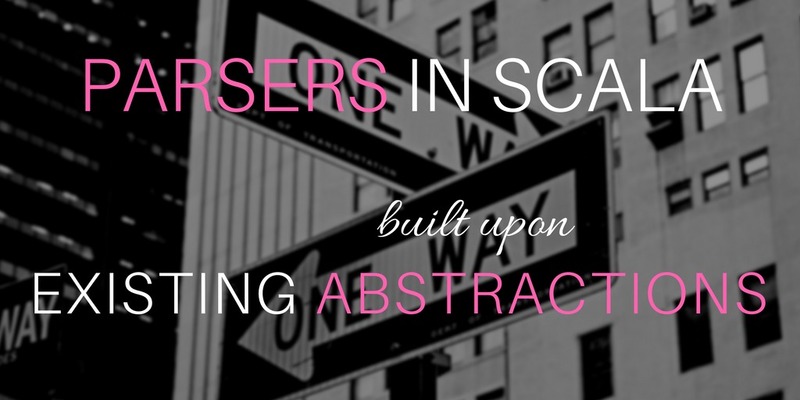 Out of nothing but few a primitives we have created a library of parsers and combinators of significantly less than 100 lines of code that allowed us to build parsers for relatively complex arithmetic expressions. Applying battle tested existing abstractions provided a lot of built in functionalities that we didn’t have to implement or test ourselves. This also reduced the amount of boiler-plate code by a great deal. Note that here are a lot more features and compositional capabilities that we get from the abstraction that we chose that we didn’t even use in these examples. Here is the primary take away from this post: When you are dealing with specific recurring problems of implementation details it is very likely that these problems have been solved before. Try to modify and refine your model and your types in such a way that you can reuse and benefit from existing abstraction. All examples are build with tut.